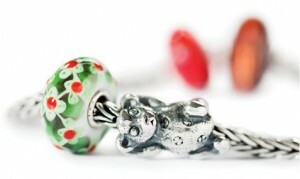 Trollbeads just announced their new winter collection which is very much inspired by the upcoming holidays. 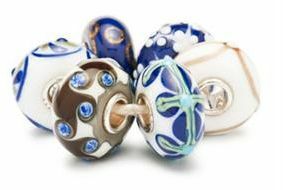 Two limited edition glass bead sets, one blue, gold and white and one in red, gold and green. The company also recently released two new additions to their Universal Uniques line – one black and one white glass bead, each set with 13 cubic Zirconias. There is currently a contest going on, where you can win beads from the winter collection by sending postcards (real ones, not virtual). 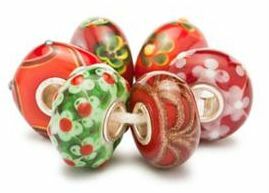 It does involve quite a bit of work: to enter, you need to register for the contest at Trollbeads Universe, you will then get a special ID number (and a lottery ticket) and the addresses of 5 other Trollbeads fans. Then, you have to go to a Trollbeads store and pick up their official Christmas cards, write a greeting and your ID on them, and send them out to the 5 people whose addresses you received when you registered. So others will be sending you cards as well, and every time you receive one, you need to log onto Trollbeads Universe and record the ID number of the person who sent you the card. This will get you additional lottery tickets. A nice idea since getting cards and letters in the mail is getting increasingly rare. For more, also see the Trollbeads News and the Even More Trollbeads… News posts.